After yesterday’s brief rally, oil markets are once again trending lower this morning, as Trump’s tariffs weaken demand forecasts while OPEC discusses increasing supply. WTI crude gained roughly 80 cents yesterday as traders swooped in to by the dip. Today, oil prices have lost nearly all of yesterday’s gains, down 65 cents to trade at $65.20. Fuel prices are also seeing losses today, though substantial gains yesterday are keeping prices net positive for this week. Diesel picked up 4.5 cents, while gasoline prices added just over 3 cents (after coming within half a cent of falling below $2/gal). Today, diesel prices are trading at $2.1239, a loss of 0.8 cents. Gasoline prices are at $2.0456, down 0.9 cents from yesterday’s close. The major market news today is Trump’s announcement that he’s asked his administration to identify $200 billion of goods from China on which to apply tariffs, a significant increase from the $50 billion of goods previously announced. In response, China has threatened to impose tariffs on a number of American goods including petroleum products. It’s an escalating rift in the relationship that could significantly impact US oil prices. The timing is actually quite amusing. On Thursday, Bloomberg published an article noting that India and China are both seeking to buy more American oil to diversify away from OPEC, putting pressure on the cartel to become more competitive with its supply. At a time when American WTI oil is trading $10 below Brent and other global corollaries (since European countries are weaning off Iranian supply and using more locally produced oil), the move makes good financial sense. That was Thursday. The next day Trump announced his $50 bn in tariffs, and China responded by threatening to impose tariffs on American oil, making WTI crude less affordable for Chinese refineries. If China follows through, it would signal lower Chinese demand for American oil, trapping more product in the US and causing prices to fall even lower. 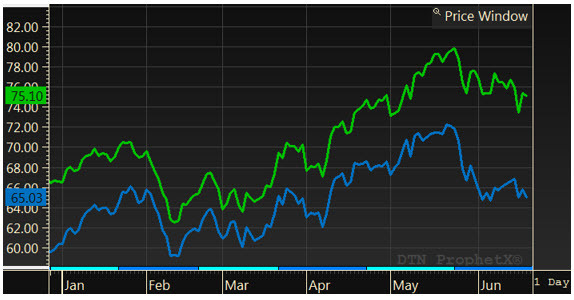 The spread between WTI crude (Blue line below) and Brent crude (Green line) has grown significantly over the past month. While WTI traded roughly $5 below Brent for most of the year, it’s fallen quickly to $10/bbl lower. Many looking at the market now believe we’re in a steeply bearish (lower biased) market now, and the outlook for prices is for continued weakness. Yet looking at Brent, which is the more heavily traded index globally, prices have only fallen slightly from their mid-May peak. The takeaway is that the sky is not falling nearly as quickly as some market analysts predict. While markets are trending lower currently, the loss is significantly less looking internationally. 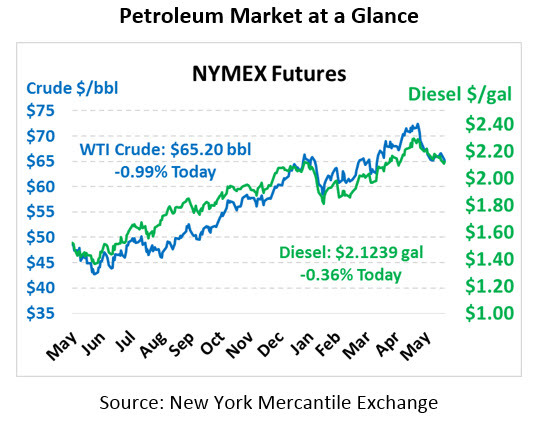 Even amid a generally weak market, there’s significant potential for American oil to become more expensive. As American export infrastructure expands and it’s cheaper and easier to export to European countries and elsewhere, expect WTI prices to quickly rebound, bringing fuel prices up with them.